I know this statement sounds heretical in the realms of education, but I think this is something we should rethink, especially since it is so widely taught to pre-service teachers. I agree that the taxonomy accurately classifies various types of cognitive thinking skills. It certainly identifies the different levels of complexity. But its organizing framework is dead wrong. Here’s why. Conceived in 1956 by a group of educators chaired by Benjamin Bloom, the taxonomy classifies skills from least to most complex. The presentation of the Taxonomy (in boththe original and revised versions) as a pyramid suggests that one cannot effectively begin to address higher levels of thinking until those below them have been thoroughly addressed. Consequently (at least in the view of many teachers who learned the taxonomy as part of their college training) Blooms becomes a “step pyramid” that one must arduously try to climb with your learners. Only the most academically adept are likely to reach the pinnacle. That’s the way I was taught it. Rather than starting with knowledge, we start with creating, and eventually discern the knowledge that we need from it. The pyramid creates the impression that there is a scarcity of creativity — only those who can traverse the bottom levels and reach the summit can be creative. And while this may be how it plays out in many schools, it’s not due to any shortage of creative potential on the part of our students. I think the narrowing pyramid also posits that our students need a lot more focus on factual knowledge than creativity, or analyzing, or evaluating and applying what they’ve learned. And in a Google-world, it’s just not true. Here’s what I propose: we flip Bloom’s taxonomy. Rather than starting with knowledge, we start with creating, and eventually discern the knowledge that we need from it. In media studies we often look at the creation of print and digital advertisements. Traditionally, students learn many of the foundational principles for creating a layout through a lecture or text book reading, and then eventually create their own. What if we started with creativity rather than principles? My students start with the standard elements of an advertisement (product photo, copy, logo etc.) and create a mockup. Then students evaluate their mock-up by comparing their ads to a few professional examples and discuss what they did right and wrong in comparison to what they’ve seen. As students are pointing out design elements that work, we begin to analyze for similarities and divide them accordingly into groups. Most will likely fall into the four design principles of contrast, repetition, alignment, and proximity. At this point, students compile their findings as a class, and only then are the four design principles formally introduced. Now students can apply what they’ve learned as they return to their own mock-up and fix elements based on the design principles they’ve begun to absorb. Finally, students research the four design principles to flesh out their understanding where needed, and possibly correct any misconceptions. From this research, students create their own graphic organizer of the four design principles for future reference and to help them remember. We started with creativity and ended with the knowledge my students have curated. They’ve been engaged with the entire process from start to finish, and my students have make some significant decisions about the essential knowledge they need. But Will it Work for Science? Not only does flipping Blooms work for classes like media studies, it also blends beautifully with my inquiry-based Chemistry class. As we study science, I’ve come to realize that it’s very important for my students to encounter a concept before fully understanding what’s going on. It makes their brain try to fill in the gaps, and the more churn a brain experiences, the more likely it’s going to retain information. When we study ionic compounds, we start with a lab. My students begin by creating conductivity testers out of tin foil, batteries, and mini Christmas lights. Students then create their own lab and test 10-12 different substances, from salt water, to HCL, to sugar water, to check which substances conduct electricity. Usually, about half of the solutions provided do. I have them compare their findings to how scientists usually categorize these solutions. Sometimes, solutions that are supposed to conduct electricity, don’t. So providing the results of experts helps them to have more confidence in their own results. However, it’s not enough to discover which substances conduct electricity. I want them to try to figure out why. With the results my students have obtained, they analyze their findings. By dividing the solutions into appropriate categories, students often discern that the solutions that conduct electricity are made up of two elements and the elements combined are found on opposite sides of the periodic table, such as NaCl. They also realize that solutions that don’t conduct, such as sugar, are usually made of elements found on the same side of the table. Once they begin to analyze each solution’s makeup more closely, they tend to realize that conductive solutions are, for the most part, made up of a metal and non-metal, whereas solutions that don’t conduct usually don’t contain any metals. Once they’ve exhausted this activity, I introduce the concepts of ionic and covalent bonds to label each category. Then students re-evaluate their own findings and apply their learning by fixing elements in their categorization system. At this point, my students research ionic and covalent bonds, either through cooperative research, or by using the flipped classroom model, to fill out their findings with information about the characteristics of each type of bond, such as malleability, boiling and melting points, etc. They’re essentially creating their own notes. Flipping Blooms — putting Creating, Evaluating, Analyzing and Applying first — also works in English. From what I can tell, it’s likely the easiest route to creating a flipped English classroom. In the past, I’ve struggled to teach my students concepts such as grammar rules and abstract ideas like voice. Flipping Blooms makes this much easier. We’re creating the churn, the friction for the brain, rather than solely focusing on acquiring rote knowledge. As a class, or in their groups, we analyze the pieces for similarities and differences and group them accordingly. Only then do I introduce the concept of run-on sentences, comma splices, and fragments. Essentially, through this process, my students identify the criteria for good writing. From this, we’re able to co-construct criteria and rubrics for summative assessments. I think the best flipped classrooms work because they spend most of their time creating, evaluating and analyzing. In a sense we’re creating the churn, the friction for the brain, rather than solely focusing on acquiring rote knowledge. The flipped classroom approach is not about watching videos. It’s about students being actively involved in their own learning and creating content in the structure that is most meaningful for them. 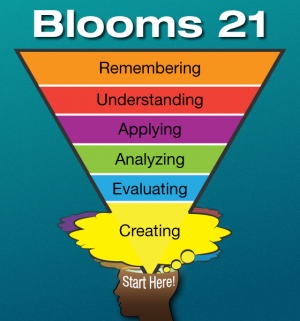 Blooms 21 actively places learning where it should be, in the hands of the learner. This post originally appeared on Voices from the Learning Revolution. Shelley Wright is a teacher/education blogger living in Moose Jaw, Saskatchewan in Canada. She teaches high school English, science and technology. Her passion in education is social justice, global education and helping her students make the world a better place. She blogs at Wright’s Room.